I will also add any recipes that I paired with the wine. I hope that I will be successful with all of my pairings, but there are never guarantees and I will report on my duds as well. My ultimate goal for each of these dinners is to end up with the same self-satisfied jaunty grin that my little friend to the left has. I also hope to leave you with a recipe that you can use to match up with a wine of your choice if you can’t locate the one I recommend. No-Guilt Wednesday is not about compromising on quality. It’s about all about drinking good wine that does not break the bank. And of course, it’s about sharing with the ones you love. Regarding Calatayud– Located in the province of Zaragoza in the Ebro River Valley, in the Northeastern quadrant of Spain, Calatayud is overshadowed by some its more famous neighbors including Rioja. The vineyards are situated on either side of the Jalon a tributary of the the Ebro River. 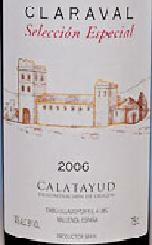 However, the limestone rich soil of Calatayud is one reason to pay attention to wines coming from this region. Another reason? The native varietal known as Garnacha (but perhaps better known as Grenache). About 2/3 of the total production in Calatayud is of this varietal which is used as a blending grape to provide some oomph to wines. According to Espavino, the 2003, 2004 and 2005 vintages are considered Very Good, while the 2006 vintage that spawned the very nice Claraval was considered merely Good. Cuisine du jour: I must really be looking for trouble trying to make paella in the middle of the week. Perhaps a lot of trouble given that the last time I tried to make paella (about two years ago) it was a memorable disaster. The flavors were spot on, but the rice was woefully undercooked. We invited two of our closest friends over for what I hoped would be a feast. In light of my prior paella experience, I spent much time worrying whether I used too much liquid, not enough, too much rice, not enough rice, etc. So I fiddled with proportions a bit. But you should not do that. The key is 3 times as much liquid as rice. This was not a difficult dish to make– and while my results were good, to be truthful, it will be a while before I master it. But my guests did not complain– there were hardly any leftovers! A 15 inch paella pan will make enough paella for 5-6 people. Heat up chicken stock till almost to boiling point. Alternatives additions– this dish would not suffer from the addition of any of the following: minced garlic, petite peas, chorizo, etc.